A group of six riders, many of them familiar to us, finished the first stage of the 2008 Tour at the back of the pack. These included teammates Christopher Froome and Gianpaolo Cheula from Barloworld (4:04 back from the leader). Final group finishing at 4:56 back: two-time Lanterne Rouge Wim Vansevenant of Silence-Lotto; Stéphane Auge of Cofidis; Magnus Backstedt of Garmin Chipotle (stage 4 Lanterne Rouge in the 2006 Tour); and officially the last rider over the line today - becoming the first Lanterne Rouge of the 2008 Tour - was Aleksandr Kuschynski of Liquigas. This is a repeat performance - curiously, Kuschynski was also the Stage One Lanterne Rouge in the 2007 Tour. (Note: his team website spells his name Aliaksandr Kuchynski). It already seems that Wim Vansevenant truly wants to retain the position of Lanterne Rouge for the third year and set a new record. Since it's a tremendously difficult accomplishment to even finish the entire 3500 km of Le Tour, let's wish him the best in accomplishing that goal. 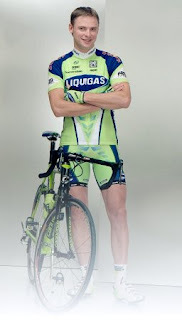 It should be noted that he is a teammate of favorite Cadel Evans and will be working on his behalf throughout the Tour. According to Cycling News: "Wim Vansevenant (Silence-Lotto), the flamme rouge [sic] in the past has some plays on repeating for 2008. "It is not a goal, but why not?" he stated to compatriot Decaluwé at the day's start in Brest. He warned is not all that easy to be the last placed rider by the race's finish in Paris, "You need to do something for it." Vansevenant's team-mate Van Summeren joked, "wasn't there a day when you fell before the finish to gain time on your rivals!"" Two-time Tour de France Lanterne Rouge Jimmy Casper (Agritubel) was involved in a crash at 52 km to go, but went on to finish 1:52 behind the leader.